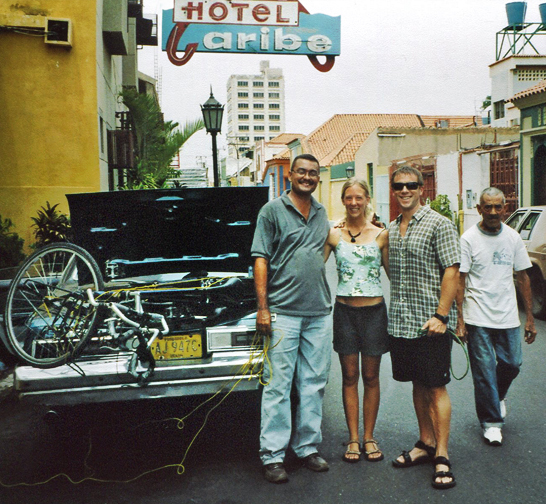 The hellish bike ride into Maracaibo convinced us we would leave that city by other means. 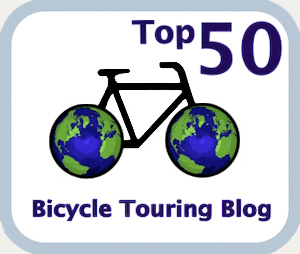 In Part One we discussed the whens and wheres of hitch-riding. Now, let’s look at the whos and hows. • Truckers: These guys cover a lot of ground and they’re usually happy to have some company. They’ve got plenty of room for your bike and the view from the cab is great. Some companies don’t want their drivers to give rides (I’ve even seen this rule painted on the passenger door), but it’s still worth a try. • Families: If they have space for you, families can be a lot of fun to travel with. They’re the safest option from your perspective – though not necessarily from theirs, so try to look as nonthreatening as possible. In “traditional” areas male cyclists should approach only the father (usually the driver). Female cyclists should approach the mother or both parents together. • Couples: Another safe option. In conservative rural areas, male cyclists must respect tradition and approach only the man. Female cyclists should approach the man and woman together. • Friendly-looking drivers: Look for drivers who react positively when you approach them (smiles, handshakes). If you’re reasonably empathetic, you can get a sense of a person right away. Lone female drivers are very unlikely to give you a ride if you’re a man. Don’t be offended. It’s not necessarily because she thinks you look creepy. It’s more to do with the small-town gossip that would ensue should a neighbour see her driving with a gringo. That said, there’s no harm in asking, especially if it’s an emergency. 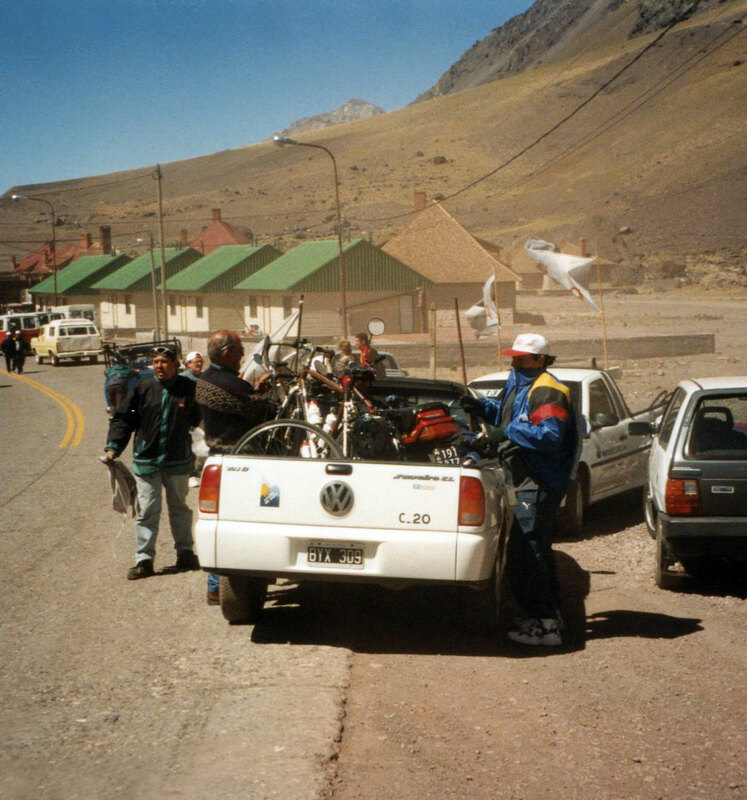 Loading up in Mendoza, Argentina. Load the bike yourself, but accept help if it’s offered. Being strong enough to lift a loaded bike onto a truck is handy when you’re on a busy road and you want to load quickly. 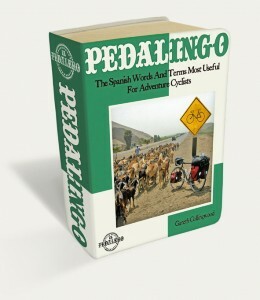 Most cyclists will have to remove the panniers first. 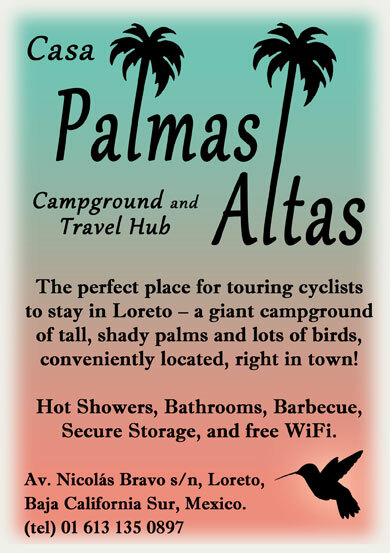 Either way, make sure to properly secure the bike and panniers once it’s loaded. Load quickly, but not sloppily. Stretch your bungee cords through the wheels to stop your bike from rolling around and damaging itself or the vehicle (avoid this embarrassing situation). If the vehicle has no hooks to attach your bungee cords, still run the cords through the wheels and around the panniers to keep everything contained. In the countryside, people are friendly, helpful, and curious, so don’t be surprised if a crowd gathers. Allow them to help and remember to say gracias. Obviously, you’ll thank someone for picking you up, but don’t overdo it or you may sound insincere. A simple gracias (or obrigado in Brazil) will do. Offer to help pay for peajes (highway tolls), gas, and meals. Your offer may be refused, but your manners will be noted. Never forget to share any snack you eat during the ride. If the driver appears drunk or suspicious in any way, politely – but firmly – decline the ride, no matter how awkward you feel. Similarly, if the driver begins boozing, swerving, or misbehaving during the ride ask to be let out at the next service station or populated area. Make any excuse you like. Be polite but insistent. The fear-mongers tell us hitch-hiking (and by extension, hitch-riding) is inherently dangerous. It’s not. Dangerous is stubbornly pedalling through driving rain on a busy highway with blind corners and no shoulder. That said, it’s worth considering some safety implications. • Don’t hitch at night unless it’s an emergency. 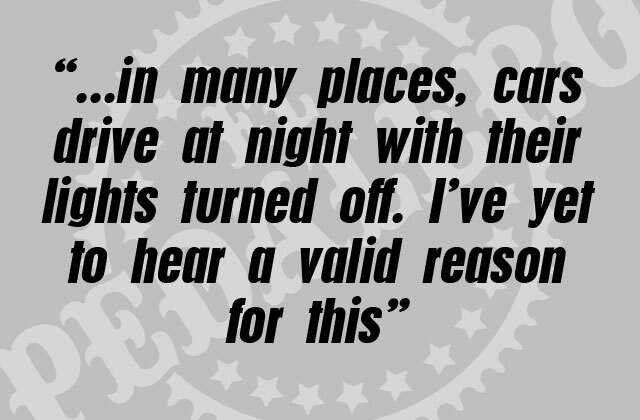 Not only is it difficult for cars to see you, but in many places, cars drive at night with their lights turned off. I’ve yet to hear a valid reason for this. • Approach drivers in public areas (gas stations and highway restaurants). Remember, this driver was minding his own business until you approached him. You initiated the situation and you did so in a public place with plenty of witnesses. • Ask drivers their destination before giving your own. It’s a good opener and it also gives you an easy out if you start feeling unsure about the driver you just approached. Wherever he says he’s going, tell him you’re heading in the opposite direction. • During the ride, steer the conversation away from money and personal matters. If you have to, say you’re broke and trying to get home. Avoiding awkward questions is one reason I prefer to ride in the back of a pickup. • Latin America has plenty of bad drivers as evidenced by the ubiquitous roadside shrines. If your driver is endangering your life (by speeding, drinking, etc.) don’t feel awkward about saying something. Be friendly, be non-accusatory, but be firm. If the driving doesn’t improve, ask to be let out. I’d like to end this section by saying again that all my hitch-riding experiences have been positive. 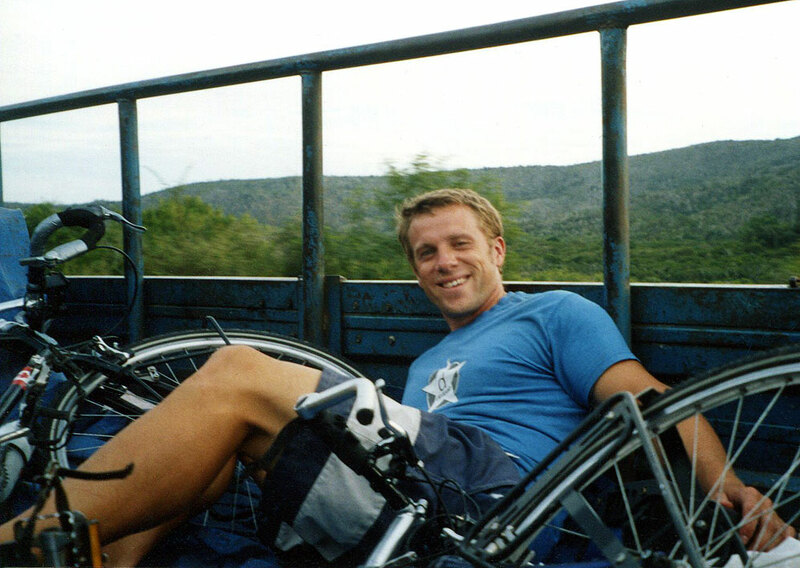 This meat truck hitch seemed fun at the time, but when we got out we noticed our clothes and gear were covered in blood. Guantánamo Province, Cuba. In most of Latin America, hitchhiking is unrestricted, but there are a few exceptions. • In Costa Rica, it’s supposedly against the law for people to ride in the back of open trucks unless they’re farm workers. Friendly ticos are more than happy to give you a ride, but usually only if they have room up front. Also, certain transport companies have a rule (often painted on the passenger door) which prohibits their drivers from giving rides to people. • Cuba is the strangest and most difficult place to hitch-ride. As things stand, it’s illegal for a Cuban in a private vehicle to give a ride to a foreigner, although I managed to get around this several times. Cuba has other cheap transportation options, also not for foreigners such as the uncomfortable gua-guas (with their easily-bribed drivers) and the hilariously unreliable yellow-stop system. is there a service station near here? ¿hay una estación de servicio por aquí cerca? 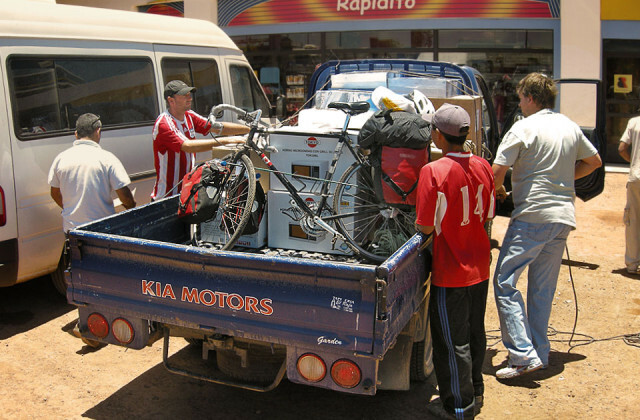 Feature image (top of page): Hitch-riding in Paraguay.